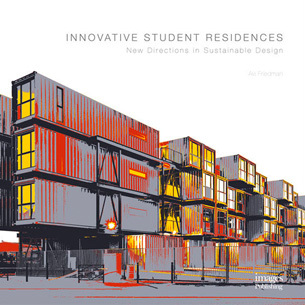 A new book, Innovative Student Residences – New Directions in Sustainable Design by practice founder John Wybor is to be released on May 30th 2016. The book coauthored with Dr Avi Friedman from McGill University, Montréal; continues a working relationship of over 10 years. John Wybor and Avi Friedman originally collaborated on the ‘Accent Home’ in 2006, which lead to the development of GWP Architectures first sustainable / affordable student accommodation project at County and Grizedale Colleges, Lancaster University. The ‘townhouse’ student living solution, with ground floor social /living space, was also first developed for this project. The book seeks to explain the new realities and challenges designers will face in the future, while also looking at the notions of flexibility and the ability to create complexes made up of prefabricated components. Designs for student life in buildings are reviewed and an examination of how designers address social spaces is included, while also covering the history of student accommodation. Two completed GWP Architecture projects are included in this publication. The previously mentioned student housing scheme at Lancaster University and the Champion Hill residences for King’s College London. The book is now available to preorder from publishers Images Publishing or online retailer Amazon and you can see sections of the book on our facebook page.